Santa Clara Vanguard took top honors in Drum Corps International's recent Operation: GrowDrumCorps campaign. The 2012 promotion accounted for more than $30,000 worth of ticket sales, with 57 World, Open and All-Age Class corps participating. The campaign ran from April 16 to May 21. During this period, fans could enter a corps-specific ID number when purchasing tickets to select 2012 DCI Tour events. Designed as a fundraiser, corps participating received five percent of the cost of tickets purchased using their unique referral code. Each year, DCI distributes close to 30 percent of its operating budget back to its participating corps. "We'll put this toward the operating costs of our drum corps," Santa Clara Vanguard Executive Director Jeff Fiedler said about the reward. 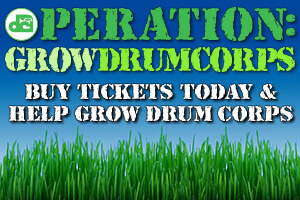 "The intent of Operation: GrowDrumCorps was to get more people in the stands this summer. With gas prices still high, for the corps, this was an opportunity to help cover some of the expense of fuel." To take the top spot in the campaign, Fiedler said his corps achieved success by reaching out to its passionate base of alumni, fans, friends and family. "Our outreach was very social media orientated, posting messages about the campaign on our Facebook and Twitter pages," Fiedler said. "Besides that, at rehearsals I would talk to the kids in the corps and say, 'Hey, if your parents or friends are going to buy a ticket, make sure they use this code.' So there was a little low tech and a little high tech involved in our approach." As the top corps, Vanguard also has the option to perform in the performance slot of its choice at one regular season event. They've chosen to take the field second to last at Drum Corps: An American Tradition on Aug. 1 in West Chester, Pa.
View the complete 2012 Drum Corps International Tour Schedule.